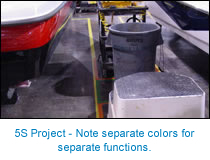 ILS has applied lean principles, practices, tools, and techniques in hundreds of businesses. We have assembled a few case studies here to explain what we did for some and how we did it. Feel free to contact us if you'd like more information about how we work. Current operation requires 3 operators: 1 controls the crane, one pours the metal, the third measures and records the temperature and times the pouring. No apparent sequencing or organisation of molds in the pouring area. Operator who controls the crane will measure and record the temperature and record the pour time. 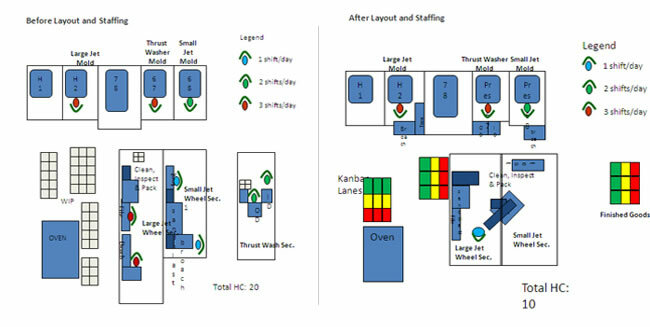 Proper organisation of molds in the pouring area will help to gain more labour efficiency for future volume increases. Current operation requires 2 operators: 1 operates the shake out machine and the other drives the forklift with which he flips the flask. Forklift drops flask after product is removed. Operator uses hoist to put flask on the shakeout machine and to remove the flask. The forklift returns, flips the cope flasks and returns them to the storage yard. Forklift loads flask onto shake out machine, operator dismounts to activate and run the machine, then removes the flask and returns it to the storage yard. No flipping operation and no hoisting operations required. 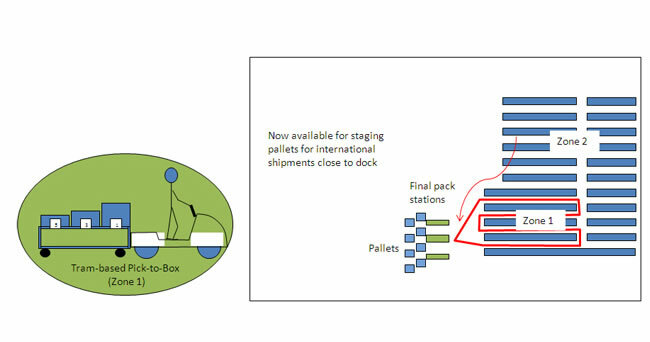 Total restructuring and standardization of operational systems at North American and European Distribution Centers. 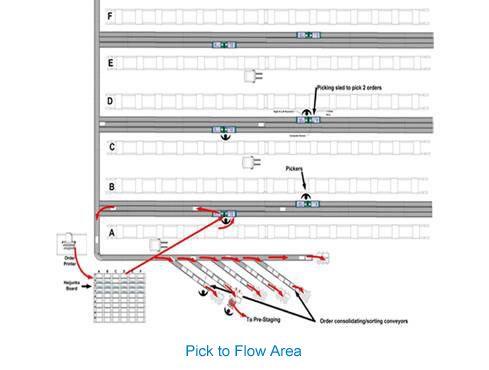 The effort included zone picking, deployment of inexpensive trams following short pick routes, relocation of inventory to enhance pick density, implementation of direct pick-to-box or pick-to-pallet to avoid material re-handling, enhancement of IT systems to speed human interfacing and increase speed and accuracy of transactions. Australian Weaving Mills (AWM) is the home of textiles for brands such as Dickies, Dri Glo, Esprit Home, Koala Blue, The Cottonfield Collection and Tara Plus brands. 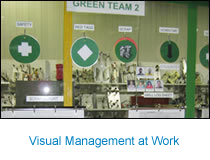 In addition to their local manufacturing, AWM has an impressive sources side to meet the local needs. 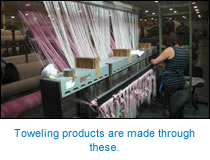 Operating in Devonport, Tasmania, AWM is today Australiaâs sole manufacturing of towelling products. After detailed discussions within the sector, a small number of strategic objectives have been identified to increase the sustainability and build internal problem-solving skills at AWM. 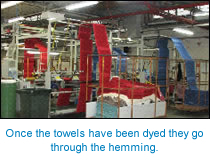 The implementation of specific lean manufacturing processes is seen as essential to the management of Australian Weaving Mills. Mr. Steve Neilly, the Manufacturing Manager, has identified the weaving and hemming sections as lead areas for piloting the Competitive Manufacturing/ Lean Initiative. In 2008, Mr Neilly and Mr Richardson attending the ILS Lean Practitioner Program (Grad Cert), which is held in Melbourne, Victoria. The Vocational Graduate Certificate requires the completion of 3 one week block of face-to-face training delivered over a 6 - 8 month period to enable time to complete enterprise based project work. The training program is driven by work place project development, where participants are required to apply their learning’s to their organizations. A four day Learning and Improvement Focused Transformation (LIFT) event then took place, allowing teams to analyze key areas of the business and apply lean tools such as 5S, visual controls, pull systems and set-up reduction principles. Moreover, teams were able to gain exposure to the different parts of the business that they would not have normally been exposed to, thus giving them a broader understanding of the operations involved in making their products. “The initial Lean training delivered by ILS at AWM has been highly successful with substantial, measurable gains being made in setup reduction time and WIP reduction in the specific target areas… and as a result has created a very positive platform to expand the adoption of Lean principles and practices into more areas of the business” commented Mr. Neilly. 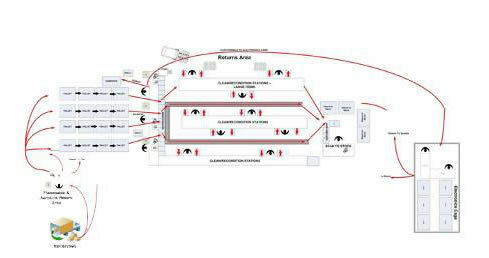 Comprehensive intervention focusing on improving production and packing cell design, distribution centre systems improvements including a visual kanban system and an internal milk-run system, various process kaizen/LIFT events, scrap reduction, process yield improvements, material and energy cost savings. 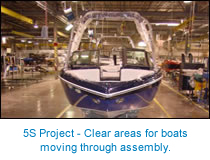 Skier’s Choice builds luxury inboard boats for skiing and wake boarding in their plant in Marysville, Tennessee. Their two key products, the Supra and the Moomba, are among the most popular boats in their class. In 2006, they began their lean journey. The company was in sound financial condition and they were meeting their demand, so they decided not to bring in an external consultant or hire a lean coordinator. Instead, they found a vendor who could teach them the lean tools and how to apply them. They began with executive education and benchmarking, getting enough knowledge to develop a more detailed plan for their transformation. 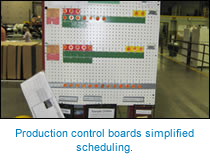 In April 2006, CEO Brad Denning attended the Lean Systems Executive Program taught by ILS team members. In August, they hosted their own executive course for their leadership team, and brought in their key suppliers and partners, like Tom Broy, president of IBBI, a buying consortium Skier’s Choice belongs to. Following the “Go and See“ rule they learned early in these workshops, Skier’s Choice took benchmarking trips to companies considered world class in many performance areas. These included Toyota, Denso, Summit Polymers, Boeing, Subaru, Batesville Casket, Budweiser and even Walmart. They also took benchmarking trips to see other boat builders such as Malibu, Cobalt, Triton, Bryant, and SeaRay. From June to December, they hosted their first on-site Lean Systems certification series of workshops. Twenty-five people from all levels of the organisation completed one three-day, high intensity workshop per month for six months, with project assignments between the courses. 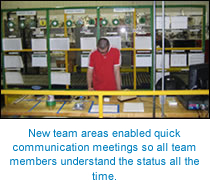 This exposed them to all the lean principles, techniques and tools, as well as all the troubles companies can experience when driving change through their organisation. 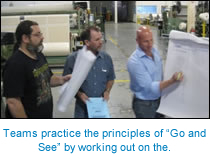 After starting their second series of workshops in January 2007, they began teaching lean basics to everyone in the company. All operators were given 20 hours of lean education. These overview workshops were taught by graduates of the first certification series, eventually teaching all 350 team members. With the completion of this training, Skier’s Choice introduced the Lean Improvement Activity Sheet to capture the ideas the workforce had, and implement them more quickly. Within a matter of weeks, they received over 600 ideas from the workforce. In the end, 75 people from every functional area in Skier’s Choice completed the full certification series; all becoming change agents within the organisation. They learned in workshops, they learned by doing their projects together and the learned by interacting with parts of the organisation they may never have spoken to before this initiative launched. This created a shift toward a continuous improvement culture in their day-to-day work, making Skier’s Choice a great place to work. In late 2008, with the economy tumbling and boat sales dropping dramatically, Skier’s Choice was able to make people-friendly adjustments (no overtime, reduced the temporary workforce, temporary furloughs and leadership pay reductions) that allowed them to absorb the change quickly. 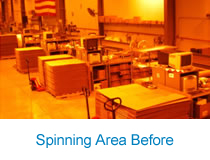 With demand down, they redoubled their efforts, and further refined their production system, fully achieving single-piece flow in their manufacturing and sub assembly operations, further reducing inventories and saving a significant amount of money to use to keep the company healthy. Says Denning, “I’m convinced that by applying what we learned from ILS when we did is a major reason we were able to keep our doors open.” As a closely held company, total savings and return on investment figures are not released at the request of the company. Columbia Forest Products is North America’s largest manufacturer of hardwood plywood and hardwood veneer. The company, based in Greensboro, N.C., employs more than 2,100 people and operates facilities throughout the United States and Canada. Much of their hardwood plywood is used by cabinet makers and installed in homes across the continent. Like other companies in the hard-hit housing sector, Columbia Forest Products has experienced some tough times. But through a partnership with the ILS, Columbia has been able to cut annual expenses by more than $12 million. ILS helped Columbia achieve the savings by standardizing work procedures and streamlining work flow to eliminate unnecessary steps and speed up production. Using “just in time” production techniques, Columbia reduced the time it takes to fill a customer’s order from around 60 hours to fewer than 8 hours – a vast improvement. 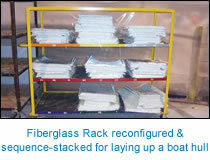 As a result, the company was able to drastically reduce inventory, which led to a significant savings. “ILS showed us how to maintain or improve productivity and improve quality with fewer resources,” said Bill Duarte, Columbia’s director of lean transformation. Columbia developed such a close relationship with ILS consultant Parthi Damodaraswamy that it named him an honorary director of lean transformation. The Strategic Transformation Partnership between ILS and Columbia began in 2006 when Columbia recognized the need to dramatically reduce its operating costs without degrading quality for its customers.Â Through ILS, they have had over 125 people in key positions throughout the company complete the ILS Lean Systems Certification Series. Columbia has aggressively conducted Rapid Improvement LIFT (Learning and Improvement Focused Transformation) events in most of its facilities, contributing to a dramatic cost savings in every target area. 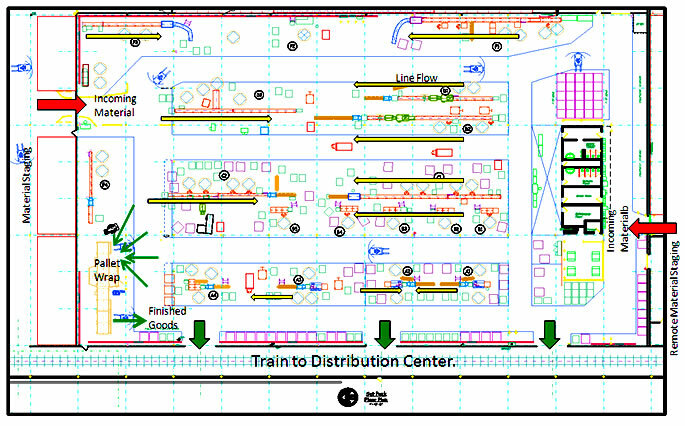 LIFT events have focused on safety, designing and implementing pull systems, co-locating equipment to optimize plant layout, inventory reductions, internal and external logistics systems, and the creation of an overall guiding Production System – The Columbia Way. They have pledged that no workers will be laid off as a result of lean activities, but are actively managing labour costs through their HR processes. 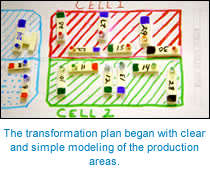 Comprehensive multi-location intervention focusing on value stream restructuring, cell formation, labour balancing (direct and indirect), improving production cell design, rapid changeover, elimination of capital expenditure needs, introduction of visual controls and energy savings. 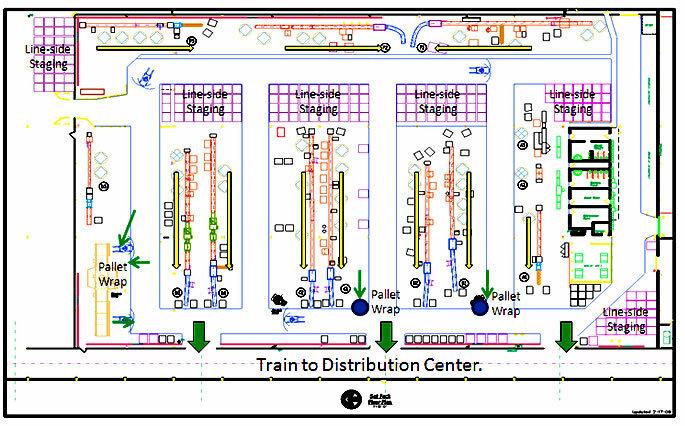 Comprehensive intervention focusing on picking process optimization, warehouse layout reorganization, reduction of capital expenditure needs, development of standardized work, sort and pack cell improvements and introduction of visual controls. Vice president and plant manager at Wabash Plastics, an Evansville, Indiana-based provider of high-quality custom plastic injection-molded parts. 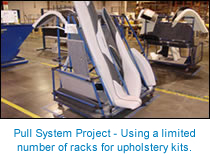 “But I didn’t see how it would work for a company like ours, where someone’s running a single machine, producing a part, putting it in a box and shipping it,” So, to get a better grasp of the Lean concept, Wabash Plastics sent its production manager to a class taught by ILS. “He came back with a much, much clearer understanding of how to implement the advantages of a Lean system in our operation,” Furniss said. Convinced that Lean might be helpful after all, Furniss and Wabash President John C. Schroeder signed up for a one-week ILS executive seminar. ”We were sold,” Furniss said. Wabash then invited ILS to the plant to meet with us and talk to us about the type of company we were and the kinds of things we were doing,” Furniss recalled. 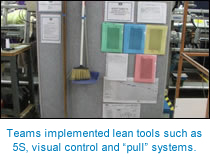 ILS put together a plan to install and implement Lean Systems throughout the company and train all of its employees. ”Our goal all along was not to install little bits and pieces of lean, but to change the culture of the whole company,” Furniss said. “We felt very strongly that employee involvement was the key. So every employee has gone through extensive training. We educated the employees to better understand what Lean is really about and how they can be a part of it, and how it can improve their job and their working conditions.” Furniss admits that some employees were skeptical at first. “But we made it clear from the very beginning that we would not lay off anybody as a result of the lean program,” he said. “In operations where there were labour savings, we’ve been able to utilize the people in other jobs.” Employees have not only accepted the changes, they’ve taken the lead in implementing them. “Our plant is organised into teams with a team leader for each group of machines,” Furniss said. “The team members actually go out and do the time studies and the measurements and come up with the ways to set up the machines and the work stations. They determine the amount of labour needed to run the jobs. The list of improvements the employees have generated is significant.” “They’ve come up with less labour than we have historically used on various jobs,” he said. Comprehensive intervention improving capacity of labour-intensive X-ray and FPI inspection lines, reducing operating shifts from 4 to 2. 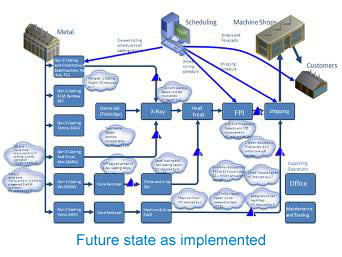 Improvement of casting OEEs from 50% to 80%, enabling additional reduction of operating shifts. Plant manager coaching to establish highly effective problem solving skills within the organisation. Participation of the entire workforce in LIFTs, averting the imminent closure of the operation. Major new contracts from European luxury automotive producers have been realized. 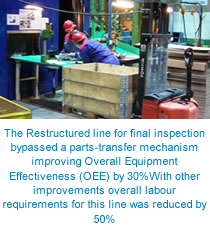 The Restructured line for final inspection bypassed a parts-transfer mechanism improving Overall Equipment Effectiveness (OEE) by 30%. 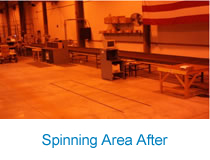 With other improvements overall labour requirements for this line was reduced by 50%.